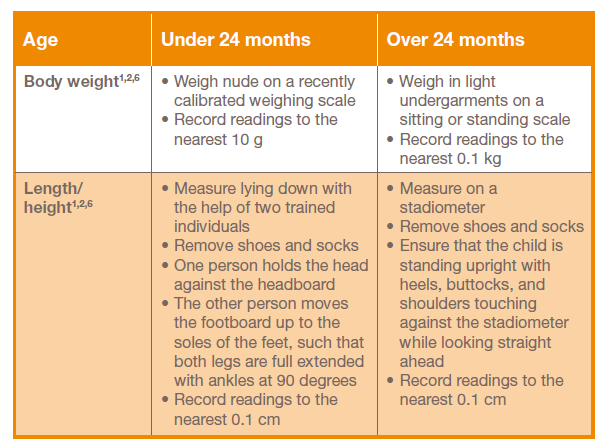 What is the right method of measuring weight and length/height? When and how often should growth be assessed? What is considered appropriate growth for children? What could signify concern for a child’s development? What are the indications for using oral nutritional supplementation? 1. Infant & Toddler Forum. Growth and its measurement: Toddler Factsheet 3.1. Trowbridge; 2014. 2. Canadian Paediatric Society. Paediatr Child Health 2010;15:84–98. 3. Michaelsen KF. World Rev Nutr Diet 2015;113:1–5. 4. Hall DM. Arch Dis Child 2000;82:10–5. 5. Voss LD & Bailey BJ. Arch Dis Child 1997;77:319–22. 6. Puntis JWL. World Rev Nutr Diet 2015;113:6–13. 7. National Institute for Health and Clinical Excellence. Public Health Guidance 11 Maternal and Child Nutrition. London; 2008. 8. Department of Health. Healthy Child Programme: Pregnancy and the first five years of life. London: Department of Health; 2010. 9. Hall D, Elliman D eds. Health for all Children. 4th ed. Oxford: Oxford University Press; 2003. 10. Marchand V et al. Paediatr Child Health 2012;17:447–54. 11. Birth to School Entry Reference Group. Guidelines for growth monitoring: Growth faltering. In: Community Health - Policies Procedures and Guidelines (Manual). Perth: Government of Western Australia, Department of Health; 2014:1–14. 12. Canadian Task Force on Preventive Health Care. CMAJ 2015;187:411–21. 13. Shields B et al. BMJ 2012;345:e5931. 14. American Academy of Pediatrics Committee on Nutrition. Pediatric Nutrition. 7th ed. (Kleinman RE, Greer FR, eds.). Elk Grove Village, IL: American Academy of Pediatrics; 2013. 15. Miceli Sopo S et al. Int Arch Allergy Immunol 2014;164:40–45. 16. Shergill-Bonner R. J Fam Health Care 2010;20:206–209. 17. Vandenplas Y et al. Nutrition 2013;29:184–194. BMI generally correlates well with percentage of body fat and is a simple method of classifying weight status. 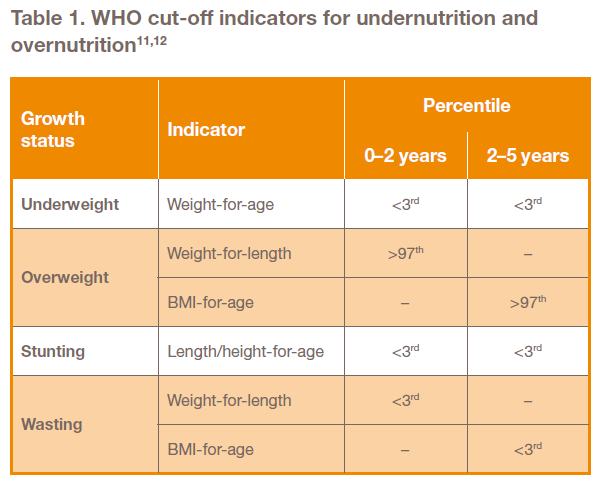 While there is an international classification for weight status, separate cut-off points have also been developed for Asians to determine public health and clinical action. This is because the risk of type 2 diabetes and cardiovascular disease was found to exist at lower BMI levels for Asian populations. World Health Organization. Obesity: preventing and managing the global epidemic. Report of a WHO Consultation. World Health Organization; Geneva: 2000.
WHO Expert Consultation. Appropriate body-mass index for Asian populations and its implications for policy and intervention strategies. The Lancet. 2004; 363: 157-163. Schofield WN. Predicting basal metabolic rate, new standards and review of previous work. Hum Nutr Clin Nutr 1985; 39: 5-41. Maqbool A, Olsen IE, Stallings VA. Clinical Assessment of Nutritional Status. In: Duggan C, Watkins JB, Walker WA, eds. Nutrition in Pediatrics: Basic Science and Clinical Applications. 4th ed. Shelton, CT: PMPH-USA; 2009: 5-13. Note: As the patient is overweight /obese (BMI ≥ 25kg/m2), an adjusted body weight will be used for calorie calculation instead. Harris J, Benedict F. Biometric studies of basal metabolism in man. Washington, DC: Carnegie Institute, 1919. American Dietetic Association. Handbook of clinical dietetics. 2nd edition. New Haven & London: Yale University Press; 1992. Sedlet KL, Pursell TA. Physician’s guide to ordering diets for adults. 4th edition. USA: Ross Products Division; 1997. FAO/WHO/UNU. Human energy requirements: Report of a joint FAO/WHO/UNU expert consultation. Food and Agriculture Organisation: Rome; 2004. For women who are pregnant or breastfeeding, weight before pregnancy should be entered. The weight had to be within the normal BMI range i.e. 18.5 - 24.9 kg/m2. This is the estimated amount of calories required to help support healthy pregnancy outcomes. This estimated amount of calories includes the energy required for adequate breast milk production. The Malnutrition Screening Tool (MST) is simple to use and has been validated to identify adult patients at risk of malnutrition upon hospital admission. 1. Have you recently lost weight without trying? How much weight have you lost? 2. Have you been eating poorly because of a decreased appetite? A score of 2 or more indicates that the patient may be at risk of malnutrition. Patient should be referred to a dietitian within 24-72 hours (depending on risk) for full assessment and intervention. For patients with a score of 0 or 1, rescreen the patient if the length of stay exceeds 7 days (and repeat weekly as needed). Ferguson M, Capra S, Bauer J, Banks M: Development of a valid and reliable malnutrition screening tool for adult acute hospital patients. Nutrition 1999;15(6):458–464. Please log in to access content. Not an ANIC member? Sign up for a free account now!